From the SciPop Interactive Press Release via. the Strategic Air Command Aerospace Museum in Ashland Nebraska. On Saturday, April 29, 2017, guests age 12 and under will received free admission for a SciPop Interactive event that ends the weeklong science festival. SciPop Interactive includes science demonstrations and hands-on activities that highlight the mystery and illusion of pop-culture icons from Star Trek, Harry Potter, and comic books. Guests are encouraged to wear their favorite costume in support of their favorite comic book or Harry Potter character. Fun hands-on activities will be part of the event from 10 a.m. to 2 p.m. with a Herbology of Harry Potter lesson, explore how cloaking devices work in Star Trek, how to make things invisible, and play with shape-shifting elements used by comic book superheroes and supervillains. There will be make-and-take projects for the first 500 youth, which include an invisible ink potion, create a comic book, and analyze alien slime. 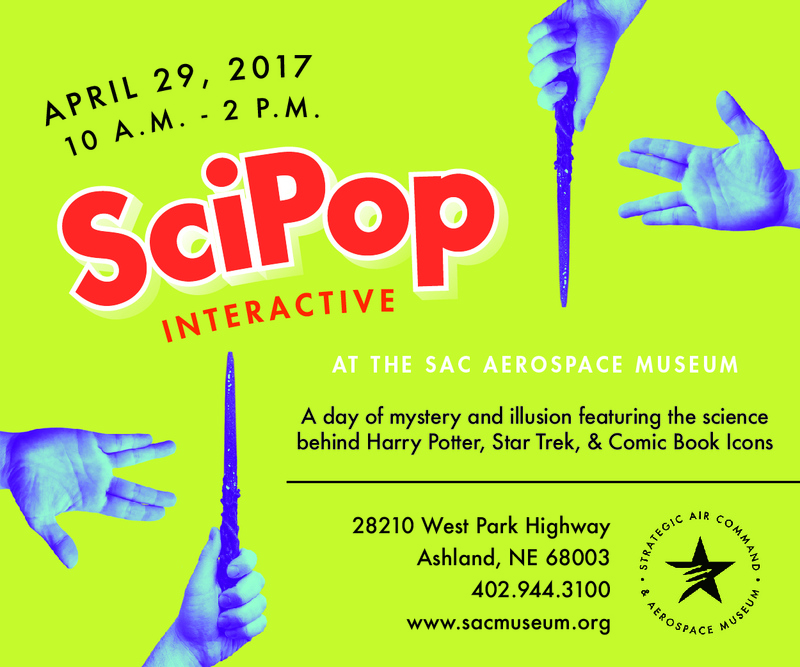 The April 29, 2017 SciPop Interactive event is sponsored by the Nebraska Local Section of the American Chemical Society and the University of Nebraska. Three University of Nebraska scientists will take the stage at various times and demonstrate the magic and mystery of chemistry and physics in our world and beyond. Professor Rebecca Lai will demonstrate the Chemistry of Harry Potter at 10:15 a.m. and12:15 p.m. Guests will learn about the magic of Hogwarts as well as examine alchemical concepts used in the books and relate them to modern chemistry. Professor Dan Claes will discuss Comic Book Physics 101: The Origin of Superman and Clues to the Planet Krypton at 11:15 a.m. and 1:15 p.m. Viewers will learn about Superman’s ability to fly, his incredible strength and his native planet Krypton. Professor Mark Griep will conclude the event at 2 p.m. with Rocket Science demonstrations that are out of this world. Young scientists will learn about the power of rocket fuel, flammable vapors, how a genie fits in a bottle, and the formation of elephant toothpaste. The event is free for guests age 12 and under and general admission applies to adults. General admission is $12 for adults and $11 for military and seniors.